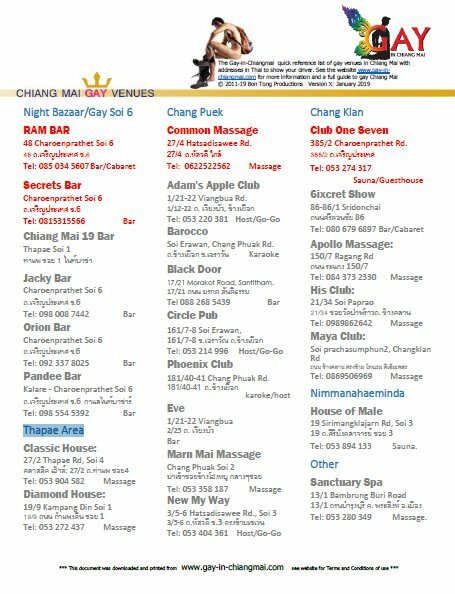 We receive a lot of feedback from Chaing Mai’s gay venues that visitors often arrive looking for the place with printouts from this website in hand. This is a web medium and whilst people are welcome to print from it’s pages, they are not ideal for use travelling around Chiang Mai looking for places. 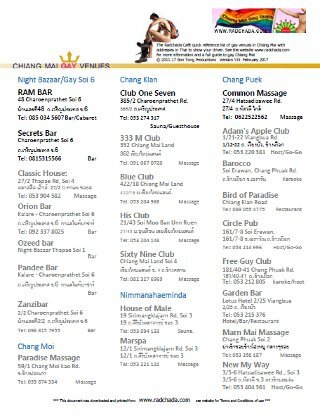 To address this we have produced a single sheet summary which you can download and print out for ease of navigation around Chiang Mai. The Quick Reference List of Gay Venues is provided as an adobe PDF file you can download and print to your requirements. It can be printed onto a single sheet of A4 sized paper then neatly folded to fit your pocket. A second page includes two useful maps of the Night Bazaar and Chang Puek area which you may also like to print. For those with smart phones the on-line alternative is our taxi guide – Go here for an easy to use map to show your driver, complete with directions in Thai for most venues. For each venue we give an indication of Venue type, address and phone number (In English. We also provide the address and directions in Thai which you can show to a Taxi or Tuk Tuk driver.